Attractions like Sea World Theme Park and Warner Bros. Movie World make great kid-friendly stops. Go for a jaunt from Broadbeach to Coomera to see Dreamworld about 32 minutes away. There's much more to do: enjoy the sand and surf at Surfers Paradise Beach, browse the different shops at Robina Town Shopping Centre, get to know the resident critters at Currumbin Wildlife Sanctuary, and stroll around James Overall Park. To see other places to visit, traveler tips, ratings, and more tourist information, refer to the Broadbeach travel planner. 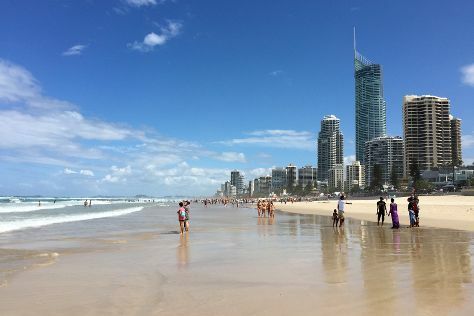 Singapore, Singapore to Broadbeach is an approximately 11-hour flight. You can also do a combination of flight and train. The time zone difference moving from Singapore Time to Australian Eastern Standard Time (Queensland) is 2 hours. Expect little chillier weather when traveling from Singapore in August: highs in Broadbeach hover around 25°C, while lows dip to 11°C. Wrap up your sightseeing by early afternoon on the 4th (Wed) to allow time for travel back home.